Nearby, an adobe house was built about 1867. It was occupied until 1898 by Leandro Serrano's widow Josefa. 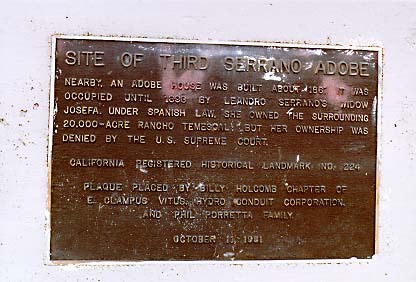 Under Spanish law, she owned the surrounding 20,000-acre Rancho Temescal; but her ownership was denied by the U.S. Supreme Court. NE corner of I-15 and old Temescal Rd, 8 mi SE of Corona.